Alex Skorkin from the DevExpress CodeRush team is on a mission to bring you all sorts of interesting news about CodeRush. And he’s working on bringing you a new CodeRush Facebook page. Since I created and now help maintain the DevExpress Facebook page, he asked me how we could add a feed for CodeRush only videos from the DevExpress YouTube channel. Sadly I could not add the query parameter. Either that or I don’t know the specific parameter for it. So to solve this problem quickly, I decided to take a look at Yahoo Pipes which allows you to "aggregate, manipulate and mashup content from around the web". Since Yahoo Pipes has been around since 2007, there are a ton of existing pipes which you can either use or copy and modify to suit your needs. So after a quick clone to make a custom tweak, I had the optimal RSS feed that only grabbed CodeRush videos from the DevExpress YouTube channel. Yahoo pipes is simple, fun and powerful. There’s a new service called "If this then that" (IFTTT.com). Unfortunately, I’m not that familiar with it but if you know how to do something similar with IFTTT.com then please leave a comment below, thanks. First you’ll need to decide on which page you want to put the theme selection combo box. 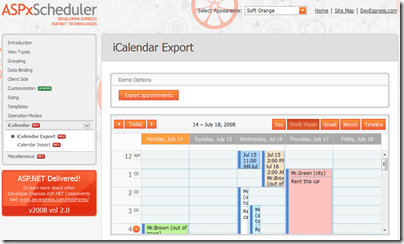 You can put it on a master page so that it’s available on all derived pages. Or you can put it on a user customization page, like an options/settings page. Putting the the combo box at the top of the page will make it easier for the user to find and select the theme. You can see a sample of this in the ASP.NET demos. I recommend binding this combo box to an XML file that contain a list of the available themes. Here’s a complete sample project that shows the combo box for themes in action [Sample project: (C#) ChooseSkinDemo.zip | (VB) ChooseSkinDemoVB.zip]. Improve your UI by adding these Developer Express themes. Then leave a comment below about how much your users love this feature. 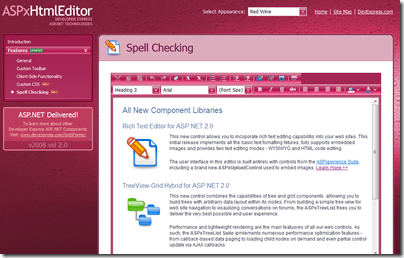 What’s New in 2008 Volume 2 for ASP.NET? Previously, enabling/disabling a control or a control element required a round trip to the server. In 2008 vol 2, the controls from the ASPxEditors and ASPxperience Libraries allow you to change their enabled state or the state of their elements (tabs, menu items) on the client side. This reduces the number of round trips to the server and increases web site responsiveness. A new server-side IsCallback property has been added to our web controls. This property allows you to find out whether a control takes part in callback processing. Some controls from the ASPxEditors Library (ASPxTextBox, ASPxMemo, ASPxListBox, ASPxComboBox and ASPxButton) can now be rendered as HTML INPUT elements of the appropriate types. 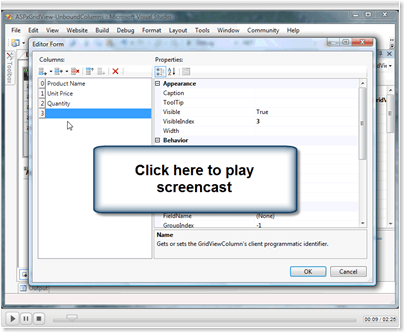 This allows you to enable native rendering for these elements thus providing Windows® style UI in your web site. Native rendering results in less HTML code which improves an application’s overall performance. The ASPxSpellChecker is now integrated into the ASPxHTMLEditor which enables spelling validation in the editor’s Design View. To check spelling, end-users can now simply press a built-in toolbar button. Previously, every toolbar button performed a very basic formatting operation – for instance, applying bold or italic formatting, changing background color, etc. Now you can create buttons that change multiple style attributes at once. This is extremely useful if end-users need to highlight multiple text fragments using the same style settings. To enable this functionality, all you need is to create a custom CSS style and expose it via a toolbar’s specially designed dropdown editor. Newly implemented client-side events allow you to respond to the focus event being received or lost by the editor’s Design View. For instance, this enables you to implement client-side user input validation when an end-user tries to leave the editor. HTML code entered into the editor’s HTML View can be automatically validated and transformed into XHTML 1.0 Transitional compliant markup. As the result, the editor’s content is always kept safe, since the editor removes all potentially harmful code – unknown tags and attributes, script elements, client-side event handlers and URLs with script content. Automatic validation also helps to keep HTML code validity by correcting invalid tag hierarchies and changing invalid attribute values. 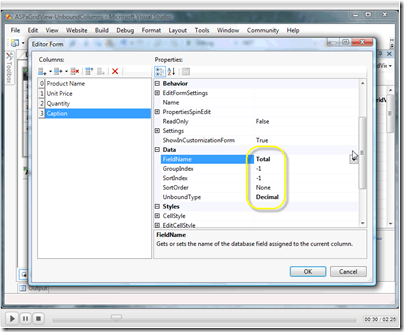 The ASPxHtmlEditor exposes several options to control which automatic transformations are required. You can also update HTML code manually by overriding an event. Some controls like the ASPxNavBar, ASPxMenu and ASPxTabControl, now expose properties which allow you to specify data fields from whose items settings are to be obtained. Examples of settings that can be fetched from a data table are item tooltips, navigation URLs, image URLs, etc. Data binding, an entirely new feature in this release, is now supported for the ASPxTabControl. Prior to v2008 vol 2, it could only work in unbound mode. All AJAX-enabled controls in the ASPxperience Suite now allow the same easy data exchange with the web server as in the ASPxGridView Suite. The Controls expose the CustomJSProperties event, which enables you to declare custom properties for the client control. You can specify these properties’ values on the server side and then access them on the client, as you would do with built-in properties. The list of allowed video and audio types has been extended with QuickTime Video and QuickTime VR (virtual reality) types. The panel’s content can now remain visible during callback processing. This behavior is optional – a loading panel is displayed by default. The support team just released a great knowledge base article which shows how to optimize the ASPxMenu control. In this article, you’ll learn how to reduce the render size of the ASPxMenu and improve your website’s speed. There are several tips and suggestions on topics like ViewState, gutters, animations, submenus, shadows and more. Then drop me a line here and let me know your experience with the suggestions. In a previous post, I showed you how to use the powerful Server mode feature in ASPxGridView and XtraGrid against large datasets. The response to Server mode was so good that we’ve extended the ways that you can enable it. You can now use a LINQ provider to work with our .NET grids in Server mode. The latest release, 2008 Volume 1, introduces two new datasources to support LINQ. LinqServerModeDataSource supports the ASPxGridView and the LinqServerModeSource supports the XtraGrid. 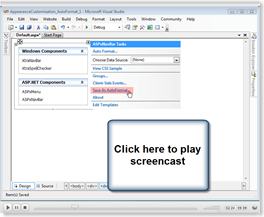 To use these datasources against either the ASPxGridView or XtraGrid, try the steps demonstrated in the short screencasts below. The LINQ support in Server mode is bleeding-edge technology which gives you the performance gains for your projects. Check out this cool feature then let me know how you’re using LINQ and how you plan to use these new LINQ datasources. 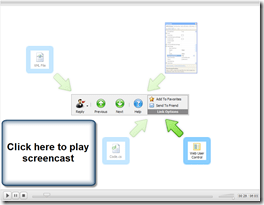 Check out these 5 new screencasts. 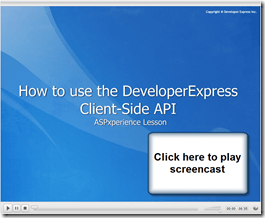 Three show you how to customize the ASPxperience products and one shows you how to discover and use the client-side events. 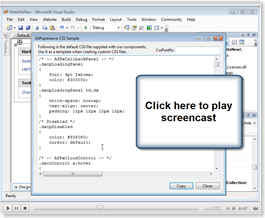 In this screencast you’ll learn how to create a new AutoFormat based on a web control’s customized visual properties and apply it to other controls of the same type. 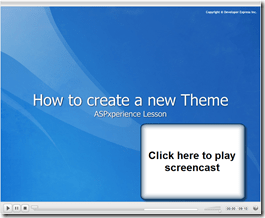 This screencast shows how to create a new theme based on a web control’s customized visual properties. You can then apply it to other controls of the same type. 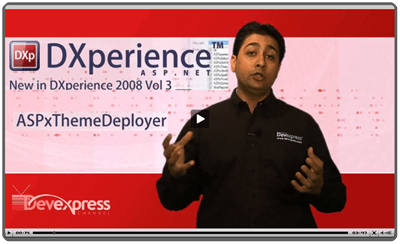 You can also access all these screencasts on the DevExpress Channel here: ASPxperience lessons. First, identify which columns use an ASPXCombobox then add the lines shown above. Now when the filter cell is initialized, the new "All" item will be added. The CustomJSProperties event enables you to declare temporary client properties. Once declared, these properties can be accessed from the client side. To add a new property, use the event parameter’s http://documentation.devexpress.com/#AspNet/clsDevExpressWebASPxGridViewASPxGridViewClientJSPropertiesEventArgstopic property (this represents a collection of property names and their values). <input id="Button2" type="button" value="Active Page"
To avoid rewriting the ASPxGridView’s base properties, prefix the client side property name with "cp" for custom property (e.g. cpPageIndex). First the disclaimers/warnings. The following uses preview technology. It requires VS2008 and the ASP.NET AJAX Extensions 3.5 Preview. You asked in the forums about using the back button with the ASPxGridView in CallBack/AJAX mode. Since AJAX doesn’t reload the page, the back button doesn’t usually work. There are methods to work around that, but Microsoft hasn’t added them to ASP.NET yet. Your questions made me wonder if I could get some back button functionality into an ASPxGridView page. So I did some research and I found a way to do it. Sort of. Experimentally. With some preview tech. Ok, it’s cutting edge, but it’s a step in the right direction. In the screencast, Bertrand uses the index property from a Wizard control to show how history is managed with the ScriptManager control. The approach uses the EnableHistory parameter of the ScriptManager to create "History Points" for the ScriptManager to navigate to when the back/forward buttons are clicked. This got me thinking that it’s possible to use the same approach with the ASPxGridView. Therefore have the ability to use the back button while still using AJAX callbacks. A history point is needed and a common history point in web grids are page numbers. 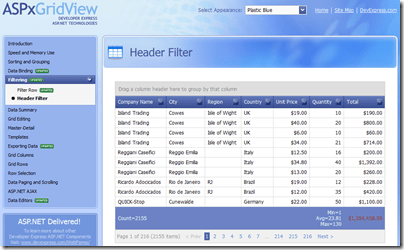 With the ASPxGridView, the PageIndex property would be the specific history point. 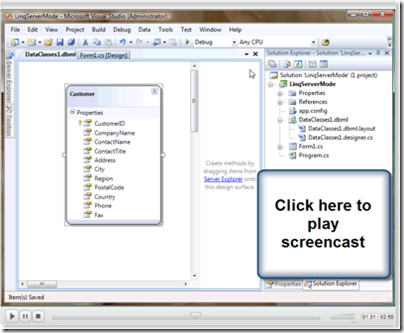 You can try the attached project for yourself but as I mentioned above, you will need the ASP.NET AJAX Extensions 3.5. Since this approach uses the ScriptManager then ASPxGridView is placed inside of an UpdatePanel. Whenever you place the ASPxGridView inside an UpdatePanel, you must set the EnableCallBacks to false because the callbacks are now handled by the ScriptManager/UpdatePanel. More disclaimers: This works only for paging. It doesn’t keep track of other operations like grouping, sorting, etc. It’ll be interesting to see how this feature evolves. 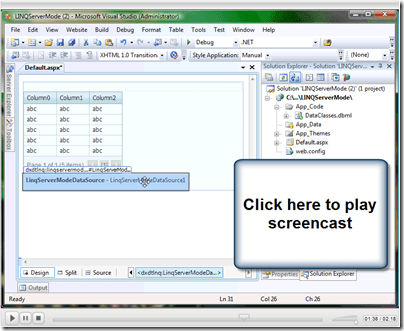 In this screencast you’ll learn how to display unbound data using unbound columns. Unbound data is typically data that does not come from your datasource. 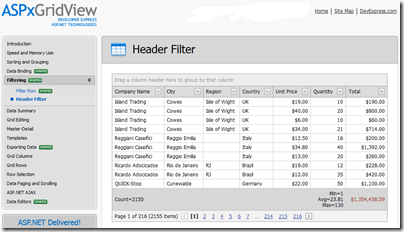 Data like calculated columns which you can easily define in the ASPxGridView. Check out the screencast and then let me know your thoughts. A how-to is also posted below. Thanks! Now define some properties for the column like the Caption(header), FieldName, UnboundType, and possibly DisplayFormatString. Since this is an unbound column, you should define UnboundType to match the data type you’ll be adding to the field. The FieldName will be used when filling the value and must be unique from any other fields in your datasource. 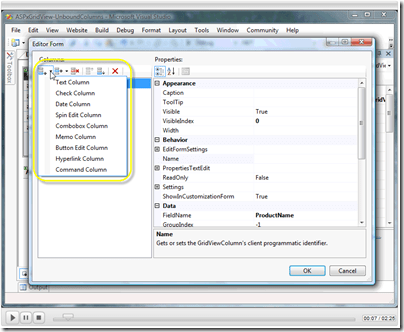 To fill the new column with data, you should handle the CustomUnboundColumnData event. Here you can assign the data value using the e.Value property. 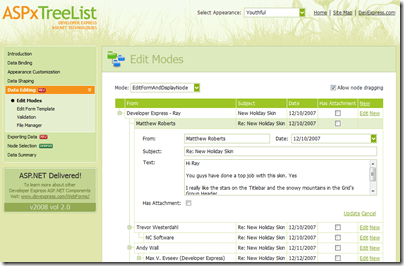 In the sample, note the e.GetListSourceFieldValue method and e.Column.FieldName property. You can use these items to check for the column and field values in the method. 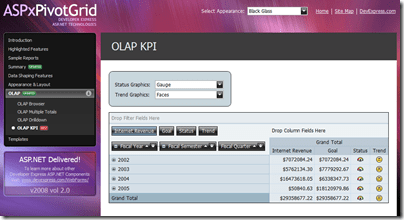 Now run the application and you have the unbound column you just created with just a few easy steps.